This photograph shows the Atchison, Topeka and Santa Fe Railway Company depot and the Fred Harvey House in Dodge City, Kansas. 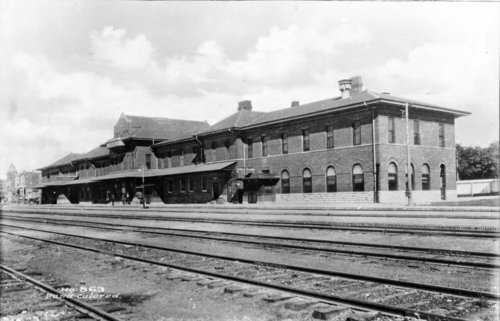 The two-story red brick building, built in 1898, included a passenger depot, the El Vaquero Harvey House, and railroad offices. In 1996 Burlington Northern Santa Fe Railway Company gave the structure to the city of Dodge City, Kansas. The building has been refurbished and was placed on the National Register of Historic Places in 2000.